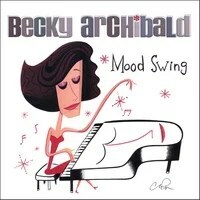 You can probably film a movie around Becky Archibald’s piano-based music; filled with color and character, her compositions and magnificent playing take a life of its own. This is perhaps best symbolized by “What Might Have Been,” a dramatic piece that could’ve been a movie score for a romantic tragedy. Such is the artistry of a woman who is skilled in letting the emotions pour through her fingertips. This is not wallpaper piano jazz; it’s music with spirit and feeling.